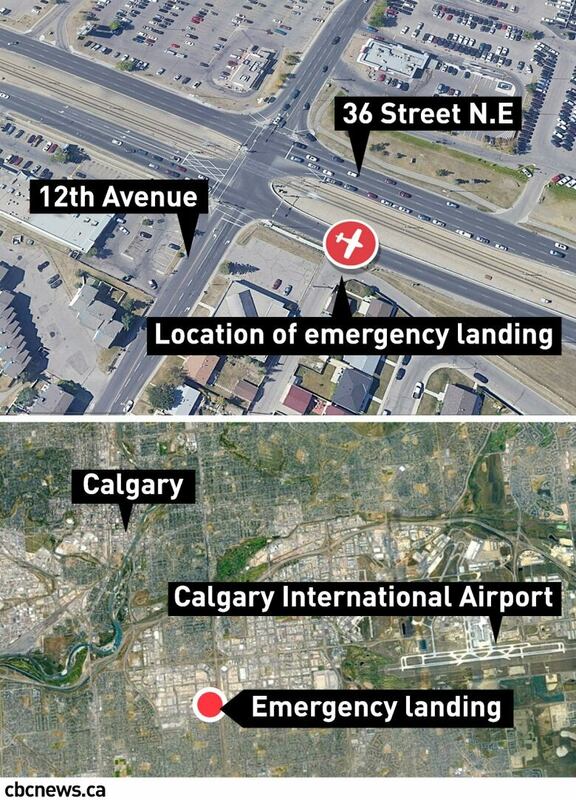 The Transportation Safety Board says a plane that was forced to make an emergency landing on a Calgary street did so because the crew mistakenly believed they were out of fuel. 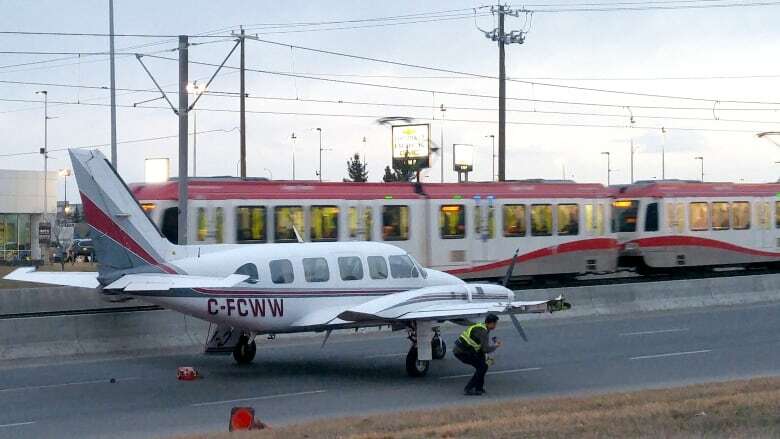 The Transportation Safety Board says a plane that was forced to make an emergency landing on a Calgary street did so because the crew hadn't switched over to the correct fuel pump, leaving the engine connected to empty fuel tanks. The Piper Navajo landed on 36th Street N.E., just south of 16th Avenue, on April 25. The small plane was headed from Medicine Hat to the Calgary International Airport with six people aboard when the pilot radioed the control tower just after 5:30 a.m. reporting a problem with the aircraft. "I've just lost the right fuel pump, that's why we're requesting 35 right," the pilot can be heard saying on the recording obtained by CBC News. The plane, registered to Super T Aviation, was towed back to the airport to be examined. Inspectors found both inboard fuel cells were approximately 75 per cent full — meaning each cell had about 40 U.S. gallons of fuel. It had taken off with 144 U.S. gallons of fuel, 56 in each inboard cell and 16 in each outboard cell, leaving the outboard cells 33 per cent full at take-off. There was damage to the right fuel pump, leaving essentially no useable fuel in the outboard fuel cells. Crew weren't able to quickly find the right pages in the standards and practices (SOPs) document, the TSB report found, due to a lack of tabs and page numbers that were too small to be useful in an emergency. And instead of using a standard method of measuring how much fuel was on board, the captain relied on GPS as well as her memory to determine when to switch fuel cells, while the first officer monitored fuel quantity gauges and the digital fuel flow meter. "The main issue was fuel management," said TSB technical investigator Jeremy Warkentin. "It's the flight crew's responsibility, part of their responsibility, to monitor the fuel state of the aircraft over the course of the flight." Warkentin said it's important that crews monitor "fuel burn" to know how long a plane can stay airborne. The crew members didn't discuss their fuel management strategies before taking off and didn't switch from the outboard tanks to the inboard tanks before descending, as that step was missing from the part of the checklist they were following. "In the description of cruise flight, the [Pilot's Operating Handbook] contains the following statement: 'If outboard cells are used during climbs, descents or prolonged unco-ordinated level flight, power loss may result even if there is appreciable fuel remaining.' [The] statement [was not] reproduced in the Super T Aviation normal procedures checklist document," the report reads. Warkentin said outboard tanks are designed just for straight-and-level flight — not takeoffs and landings — and contain significantly less fuel than the inboard tanks. Partway into the flight when the right engine began to surge from the perceived lack of fuel, the crew ran their engine failure in-flight checklist, but skipped a "cause check," which would have directed them to check fuel flow, quantity and whether the plane was drawing fuel from the inboard or outboard cells. "As shown in this occurrence, when fuel management SOPs are not in place, fuel starvation can occur even if there is sufficient fuel remaining on board the aircraft to complete the planned flight. In addition, if flight crews do not complete checklist procedures in their entirety, opportunities to rectify emergency situations can be lost," the report read. No one was injured in the emergency landing, but the plane was damaged when it clipped a light post during its descent. Both the pilot and first officer had the necessary licences. The pilot had accumulated more than 9,500 hours of total flight time, and the first officer had 948 hours. Both were employed by Super T.
Neither the company nor the TSB named the two crew members. The four passengers were employees of Calgary-based Connacher Oil and Gas Ltd. Fatigue was not considered a factor in the accident, the report read. Warkentin said the report was intended simply to analyze any safety deficiencies in the plane or crew's operating procedures, rather than provide analysis on whether or not the crew did the right thing in the moment. He said once the plane was connected to the inboard fuel pump back at the hangar, the power worked just fine. At the time of the incident, the company said the crew did an "exemplary job" in a "very difficult situation." 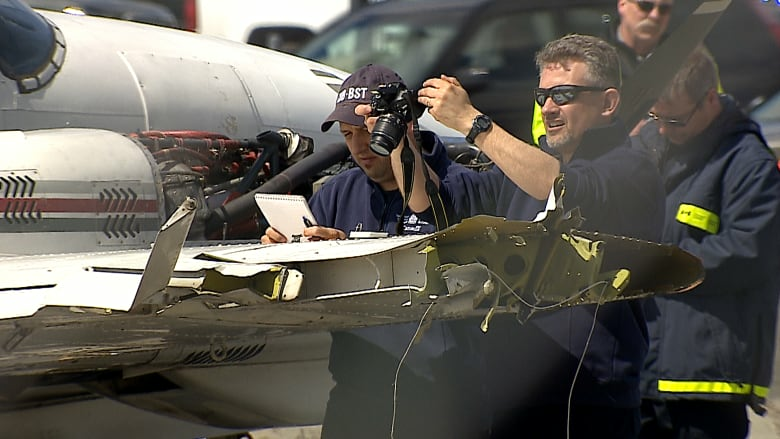 Super T Aviation has changed its procedure checklists and added tabs to allow crews to quickly find the necessary pages of the manual, following the incident, and has submitted the changes to Transport Canada, the TSB said. The company is also amending its training for new crew members as well as its emergency response plan.